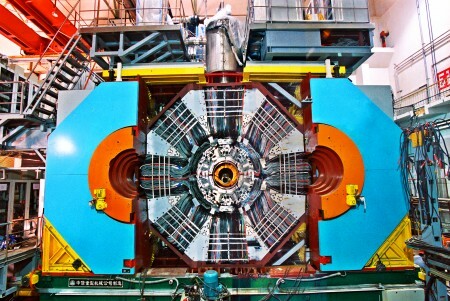 The Beijing Spectrometer Experiment (BESIII) found evidence of a new particle that may contain four quarks. The same particle was independently found at the Belle experiment in Japan, with both projects publishing their results June 17, 2013. A new type of particle may have shown up independently at two particle accelerators, physicists say. The particle, made of four quarks (the ingredients of protons and neutrons), appears to represent a state of matter previously unknown. Signs of the particle were sighted at the Belle experiment in Japan and the Beijing Spectrometer Experiment (BESIII) in China. Scientists can’t be sure what the particle is made of, or if it’s even a single particle at all — there’s a chance it could be two particles, each made of a pair of quarks, bound together. But nothing like it has been seen before, and the discovery offers the hope of clarifying the strange nature of quarks.